Backup is automated: see Platform cronfile.txt and the backup.sh script. Only dynamic data is backed-up as all code is in GitHub and the entire platform can be rebuild in minutes. Show quota with command: ssh vps68271@backup quota . To restore, when e.g. the /var/smartem dir is inadvertently deleted (as has happened once), the entire data and services can be restored in minutes. Only all logging info cannot be restored. Also handy when moving data to another server. Latest nightly backups should be under /var/smartem/backup, in worser cases under the vps backup (see above). Be sure to have no ETL nor services running. PostGIS and InfluxDB can be restored as follows. Calibration Images can be restored as follows. In cases where for example calibration has changed, we need to republish all (refined) data to the SOS and STA. This is not required for data in GeoServer since it directly uses the Refined DB tables. SOS and STA keep their own (PostGIS) databases, hence these must be refilled. Next do STA and/or SOS specific initializations. This is specific to STA server from SensorUp. This is specific to SOS server from 52North. All dynamic data can be found under /var/smartem/data. This needs to be intalled from time to time on the production server. Two parts are incolved: database schema (the model) and images (the results/stats). All can be restored as follows, assuming we have the data in some backup. There is a simple password-protected admin UI for several tasks and inpections. 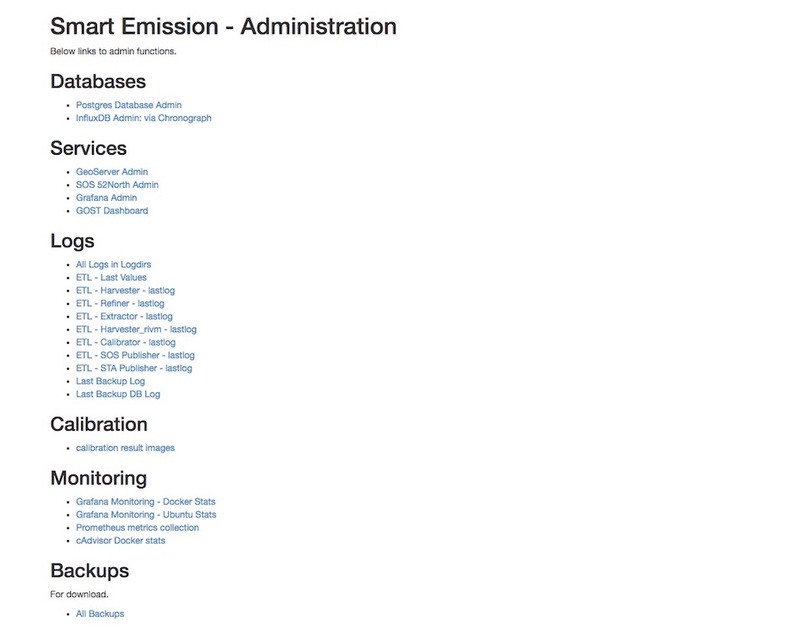 The Admin URL can be found via the “Links” entry SE Platform website (<data|test>.smartemission.nl). Via a main screen admin tasks and inpections are selected. Management of Postgres/PostGIS DB data is provided via phppgadmin. 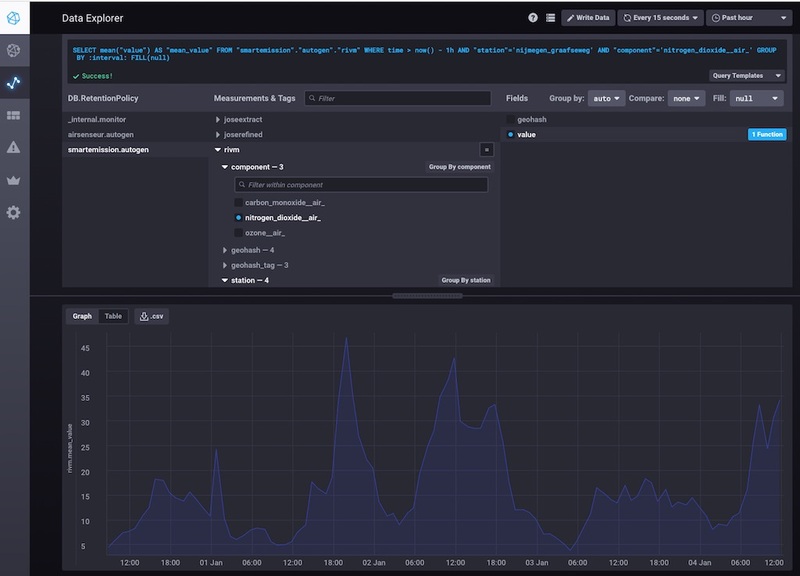 Management of InfluxDB data is provided via Chronograf. Also possibility to develop dashboards. All log files for the ETL and for the application services can be accessed via the admin screen. 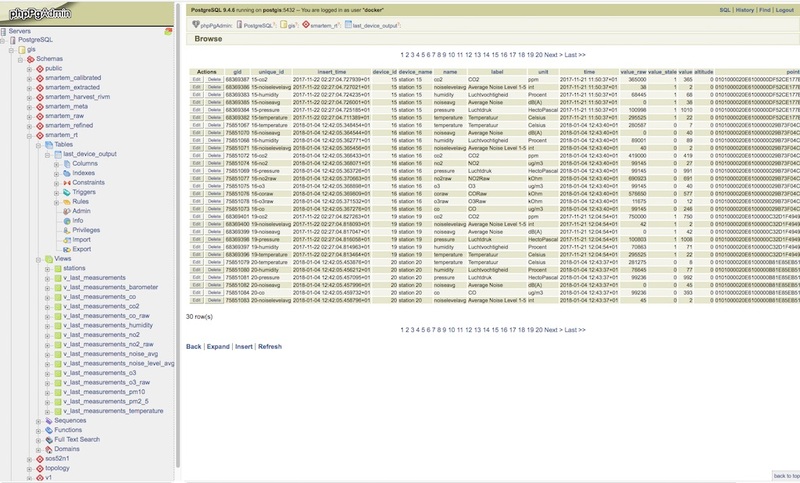 Local monitoring tools are invoked from the admin screen (see above). All SE API services (WMS, WFS, SOS, STA etc) and external APIs (Whale Server, Intemo Harvester) are monitored via UptimeRobot.com. Notification of downtime os via email or SMS. All systems (Ubuntu OS, Docker etc) are monitored using Prometheus with Exporters and Grafana. Prometheus collects and stores data as timeseries by pulling metrics from Exporters. An Exporter collects local metric data and exposes these via a uniform HTTP API through which Prometheus pulls. Each Exporter is resource-specific: e.g. a Node Exporter collects metrics from a Linux OS. Google cAdvisor will be used to collect and expose Docker metrics. 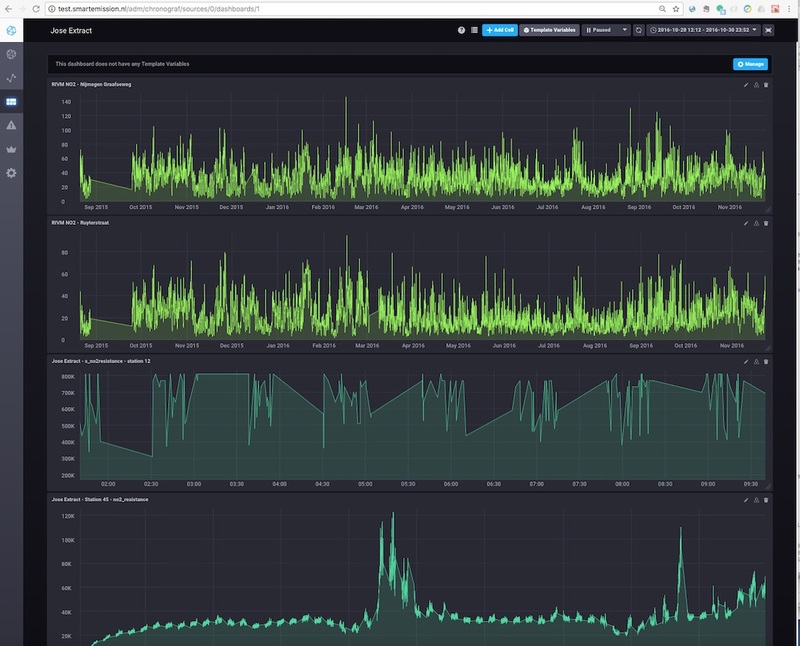 Grafana uses Prometheus as a Data source, providing various standard Dashboards for visualization. Also Alerting can be configured via Prometheus, using the AlertManager to send to various alerting destinations (email, SMS, webhook etc). A complete setup for the above can be found at https://github.com/vegasbrianc/prometheus. This is used as a base for SE monitoring. 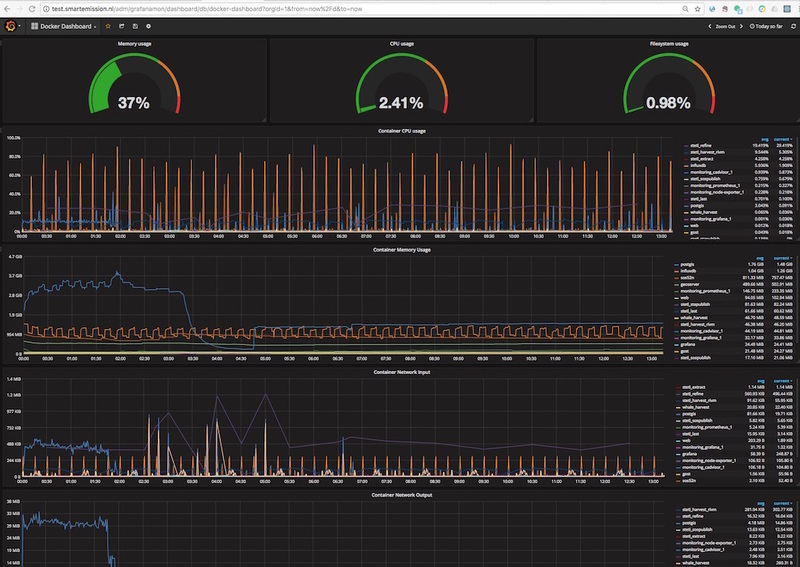 Grafana monitoring Dashboards can be accessed via the SE Admin UI. Various issues found and their solutions. This may happen after a Ubuntu (kernel) upgrade. In syslog “[graphdriver] prior storage driver “aufs” failed: driver not supported”. Solution: https://github.com/docker/docker/issues/14026 : Remove dir /var/lib/docker/aufs.